Our second week at Acadia brought us more beautiful weather, so we made sure to take advantage of it. Quite honestly, we had no idea what to expect for early June when we booked our reservations earlier this year. We were pleasantly surprised, to say the least! 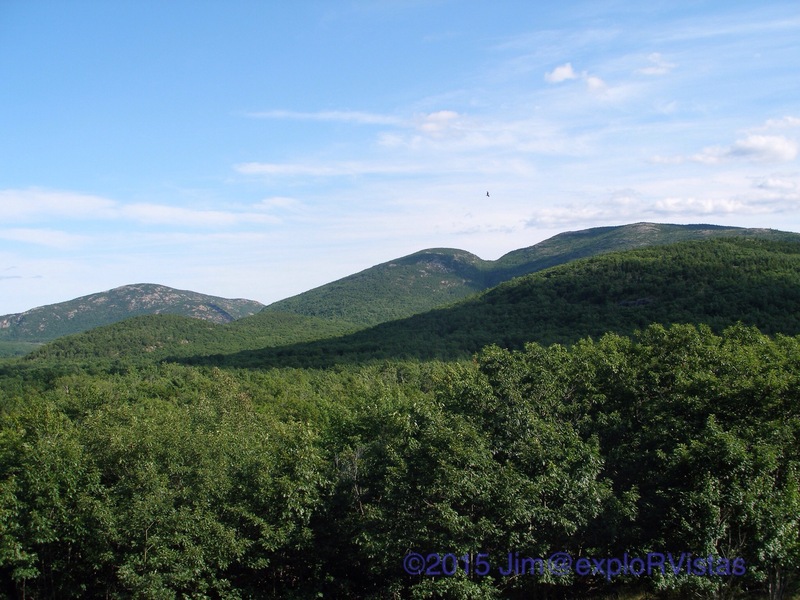 On June 9, we headed to Gorham Mountain. This trail is the first in a series of trails leading to the peaks in the southeastern part of the park. We didn’t have to climb very far for the views to open up. This view looks south towards Otter Point. Diana spotted this beautiful buck as he crossed the trail ahead of us. And here is the summit! On June 10, we thought we would give ourselves a little break, so we went to the Abbe Museum in Bar Harbor. This is actually a second location for them, with the first being within Acadia National Park boundaries. Founded in 1926 by Dr. Robert Abbe, a prominent New York physician, this affiliate of the Smithsonian Institute showcases the Native American people of the region. The area is unique in that several tribes banded together in order to better deal with the incoming European settlers. They called themselves Wabanaki. It is interesting that their tribal boundaries don’t coincide with the international boundaries, so that presents a whole host of challenges even to this day. One of the things we found fascinating was their collection of root clubs. These were carved from the lower portion of small trees. And while they are intricate and quite beautiful, one has to think how much it would hurt to get a clunk on the head from one of these! From Abbe Museum, we went to Thuya Gardens in Northeast Harbor. To get there, we had to climb Asticou Terraces, a 200 foot high path sculpted into the side of Juniper Hill. From the top, a commanding view of Northeast Harbor can be seen. It is considered a pleasure harbor, even though there are a number of lobster boats here. Set back from the terraces is Thuya Lodge, the summer home of Joseph H. Curtis. He was a Boston-based landscape architect. He designed the terraces after finishing the home in 1916. The interior is much the way it was when he died in 1928, including the furnishings. The gardens that now sit behind the home were actually an apple orchard he had planted. His friend Charles Savage completed the gardens at a later date. This is the lone surviving apple tree from the Curtis orchard. Not a lot was currently in bloom, but the space was peaceful and green. Definitely a nice place to spend a little time. Next, we visited one of Savage’s other creations, Asticou Gardens. It sits down at road level, not far from the Asticou Terraces. There was a lot more in bloom down there! June 11 started out rainy, so after taking care of paperwork at home, we went down to the Bar Harbor waterfront and ate dinner at Geddy’s. We noticed that they had some gluten free offerings on their sign out front, so that was what attracted us. Imagine my surprise when the waiter told us that all their fryers and breading were gluten-free (made with rice and other flours instead of wheat, barley and rye), as it was just easier for them to do that than to have to be careful about cross contamination. That is the first deep fried fish I’ve had since 2011…and it was outstanding! Washed down with an Omission GF lager, of course! Note: We came back later in the week to try their pizza. Pat’s…another pizza joint in town… is better and FAR cheaper. June 12 brought us another new Acadia experience. All the years we’ve been coming here, we had no idea that the park has a bona fide waterfall. We set out on John D. Rockefeller’s carriage roads to find it. This is the bridge that spans the creek below the falls. Climbing down into the creekbed, you are able to see how Rockefeller had the arch built off-perpendicular to the roadway. His reasoning was so that the arch itself framed the cascade. While it wasn’t flowing much, it still was beautiful. Instead of retracing our steps down the carriage road, we opted to take the trail that runs along the creek bed. When we returned to the car, we drove to the Abbe Museum location that is in the park. Our admission for both locations was covered by our North American Reciprocal Museum membership. This is one of only two independent trail-side museums in the national parks. The other is at Glacier Point in Yosemite National Park. This location opened in 1928. On June 13, we decided to go see Thunder Hole, the chasm that rumbles and sprays seawater everywhere when conditions are right. We knew there was a strong southerly wind, so there was a chance we would be in luck. For reference, Thunder Hole is on the southeast shore of Mount Desert Island. This is so typical of what most tourists think of Acadia. Buses pull up bringing throngs of people off of the cruise ships to see a few attractions. Conditions weren’t right, so Thunder Hole was quiet…yet these folks all were waiting for something to happen. I could see off in the distance across the bay that waves were breaking on Schoodic Peninsula’s southwest shore. So off we went for Otter Point, just to the south of Thunder Hole. The farther west we walked, the bigger the surf was. This trail is called Ocean Path, and it has quite a few elevation changes. That wraps up our time heading up the Eastern Seaboard. Next up, we head inland towards New Hampshire. That turns into more of an adventure than we bargained for, so be sure to stop by for our next installment to see what happened. Until then, safe and happy travels! If there is one place in the United States that speaks louder to us than all the others, Acadia National Park is it. This was our tenth visit here since 1986. Even after two weeks of exploring the park, we found it difficult to leave. 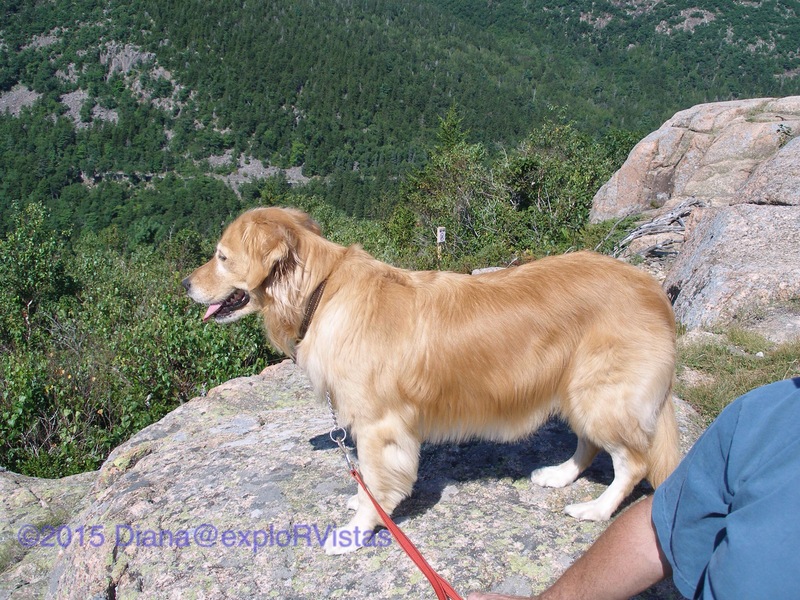 In our February 2015 post, Acadia National Park – Throwback Thursday, I stated “Diana and I chuckle when we meet people who tell us that they spent the day there and ‘saw everything there was to see’. We have yet to become bored with Acadia, and we discover another layer each time we go.” We are happy to report that we still were able to uncover even more of Acadia’s layers. With this being our longest visit to date, we are going to divide our stay into two posts. As is most often the case for us, our base was at Mt. Desert Narrows Camping Resort. Located on Thomas Bay, it gives an incredible view of the areas twelve foot tides. After picking up our park literature and Junior Ranger books, we started reacquainting ourselves with the park. On June 2nd, we drove up to the summit of Cadillac Mountain. This peak sits at 1530 feet above sea level, and offers tremendous views of the area. We climbed this mountain back in the 1990’s with our dogs, Katie and Dakota. The benchmark for the true peak is not the Summit Trail where they send the tourists. It is actually up the hill behind the gift shop on the South Ridge Trail. From there, we drove down to Jordan Pond House, a restaurant within the park boundaries. This is the place where the elite used to come for afternoon tea and popovers on the expansive lawn. To our surprise, the ‘lawn’ was in the middle of a major restoration! Oh well…maybe next time. They actually are slated to have the project completed by the end of June. Behind Jordan Pond House is a trail head that leads down to Jordan Stream. Taking that short trail is probably the best example of how easy it is to find solitude in this well used park. As you walk down through the pines, the sound of the people at the restaurant fades away quickly. After crossing one of the park’s motor-free carriage roads, the human voices are replaced with the sounds of the stream. On June 3, we returned to one of our favorite climbs, South Bubble Mountain. This is the first trail we did at the park back in 1986. This vista looks south over Jordan Pond, a body of water we have kayaked several times. It was a tad nippy for us to put them on the lake this time. Along the east side of the mountaintop is Bubble Rock, a glacial erratic that was deposited here at the end of the last ice age. While it looks like it is going to fall, it is actually quite stable. The rock it is made of came from strata nearly 40 miles to the north. As always, South Bubble summit brings a smile to our faces! One note on this trail: The park has improved the mid-section of this path since our last visit. If you were here in the past, you will find this hike a lot easier than it used to be. On June 4, we drove the remainder of the Park Loop Road. Sand Beach had plenty of people on it, despite being on the frigid waters of the North Atlantic. The beach is actually made up of fine pieces of granite and is the only ocean beach in this area of Maine. This spot is usually the place to be on a hot August day. While we were standing there, one of the cruise ships that frequent Bar Harbor could be seen leaving the port. Further up the road, we stopped at the Precipice Trail. It is currently closed because a pair of Peregrine falcons are attempting to nest there, as is quite often the case. That challenging trail along the cliffs of Champlain Mountain was laid out by Rudolph Brunnow at the beginning of the 20th century. Brunnow was a well-to-do Princeton professor back then He built this ‘cottage’ below the trail for his English fiancee, who was coming to America to marry him. She unfortunately never saw it, as she booked passage to the United States on the Titanic in 1912. 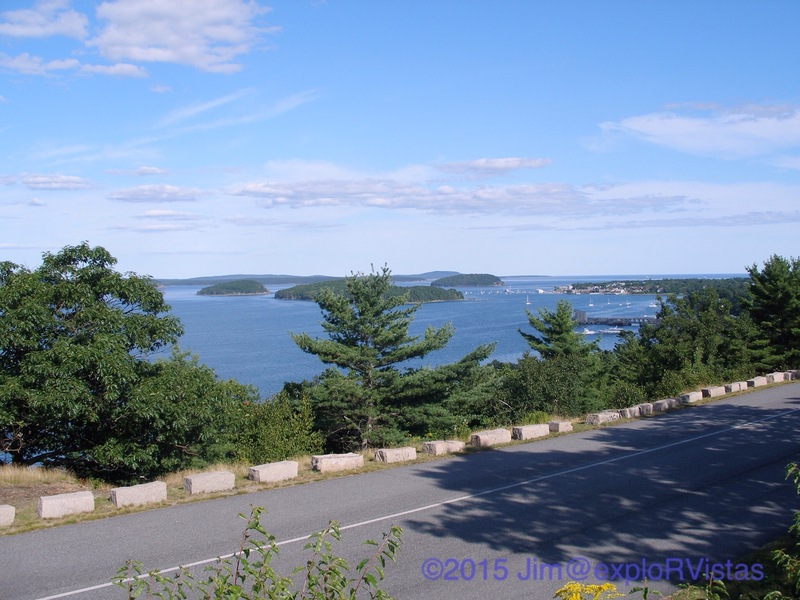 June 6 took us to the western side of Mount Desert Island, commonly known as the ‘quiet side’. Most of the parks activity is found on the east side of the island, so its nice to see the little fishing villages over here. We did some shopping in Southwest Harbor, a quaint town on a working harbor. This is also where Bass Harbor Head Lighthouse is located. This is a tough photograph to get, as that spruce tree to the right of the light has grown quite a bit over the years. On the way back, we stopped at Atlantic Brewing Company. Since the last time we were here in 2010, they’ve partnered with Mainely Meat BBQ. We were stuffed by the time we left! The next day, we took on a new-to-us hike. This was a relatively easy walk on a carriage road along the west side of Eagle Lake, followed by a rock scramble up the side of Conner’s Nubble. A quick word about the carriage roads: John D. Rockefeller donated and supervised the construction of over 50 miles of these paths on Mount Desert Island. His roads are beautiful. They are open to hikers, horses and non-motorized bikes. These sign posts can be found at path intersections. The numbers on the bottom of the posts correspond with the numbers found on the carriage road map. The path up to the top of Conner’s Nubble was one of the toughest we had seen in the park. It didn’t seem to be heavily traveled, so maintaining it must not be a priority. But check out this view above the trees! That is Eagle Lake, looking north. Our car is parked at the far end, for reference. Retracing our steps, we passed under one of the beautiful stone bridges that grace the carriage roads. On June 8, we did another trail we had never done before; Great Head. This is a fairly easy path that runs along the backbone of Great Head, just to the east of Sand Beach. There are some nice coastal views from the summit, including this one over the rock called Old Soaker. This is also one of the best places to see Egg Rock Lighthouse, short of being on a boat. Schoodic Peninsula can be seen in the distance. From there, we drove up to the top of Cadillac Mountain again to catch a sunset. While sunrises are popular from up here (its the first place to see the sun in the U.S. each morning), we prefer the other end of the day. As usual, the sunset from Blue Hill Overlook was beautiful. If you ever come for a sunset here, come early (to get a parking spot), dress warm, and stay a half hour after the sun actually sets. If there are wispy clouds, the entire sky lights up at that point. That’s our first week at Acadia National Park! Be sure to check in next time when we discover several other new places undiscovered on previous visits. Until then, safe and happy travels! Pulling up stakes in Cape Cod and heading northward into Maine, we made a couple of noteworthy stops. The first one was in Brentwood, New Hampshire at a Boondockers Welcome location, Winterwood Farm. Our hosts provided us with a level site next to their barn for two nights, complete with 30 amp electric. Per the rules of the organization, we won’t reveal their names on social media or this blog. We will say that they were wonderful hosts! After getting to know them a bit, we headed off to the town of Exeter, New Hampshire. We had dinner reservations, as it was my sweetie’s birthday! We had a window seat at a place called Hemmingway’s. It was yummy! From there we headed to Stone Church in the town of New Preston, an 1824 former church turned pub. We were looking for live music, and it turns out our host was playing banjo in a jam session that night. What a great time! We stuck around for several songs, then headed home for the night. The next day, we explored the area a bit. Diana’s long-time friend Debi has a brother who is part owner of North Country Hard Cider, which was located nearby in the town of Rollinsford. Unfortunately they were closed that day, but we were able to purchase some of North Country’s Original Press at a local convenience store. They definitely have a great product! We had a fantastic stay at Winterwood Farm. If you are a Boondockers Welcome member, be sure to look them up. They are wonderful hosts! The next day, we headed into Maine. We came to the Pine Tree State once every three years, from 1986 through 2010. That streak was sidetracked while we were responsible for Diana’s mom, so we missed 2013 and 2016. Crossing the border was like coming home. Our destination for the night was a Harvest Host location, Misty Acres Alpaca Farm in Sidney. What an amazing place! Charlie greeted us and gave us a choice of places to park. We chose the big barn, giving us a chance to fill our water tank and grab enough electric to keep our battery charged. Not only that, we had a nice view of the pasture! Diana took the opportunity to bottle feed one of the little ones. It had yet to be named; she put her vote in for the name Cocoa. This tiny white one is named Miracle. She was prematurely born on a very cold spring evening. Fortunately Charlie found her when he fed the herd, as she would have froze by morning. He and his wife Connie took her in the house and gave her warm baths and nursed her back to health. She is doing really well! They also have a store filled with alpaca clothing. We brought home a pair of socks, a scarf, and a few shoe inserts. I’m here to tell you that the inserts are like a dream in my slippers! We thoroughly enjoyed our stay with Charlie and Connie! They welcomed us back, and we will definitely take them up on that! Next up: We come home to Acadia, after an eight year hiatus. Be sure to stay tuned for what will be multiple posts on this beautiful slice of heaven. Until then, safe and happy travels! Note: Be sure to take a look at our header menu for our new page Modifications and Repairs. This is the place that deals with anything of that nature in our travels thus far. As new issues crop up, we will share them with you on that page. The month of March has ended up being extremely busy for us, as we finished up our ‘to-do‘ list, socialized, and planned our spring and summer travels. We started out the month with a day trip to Lakeland to watch our friend’s (Jim and Sue) son play baseball. Jake pitches for Fontbonne University, and their team was playing at the Central Florida Invitational Tournament. I played catch with him back in 2012 when he was only about 12 years old. Catching his fastball gave me a swollen and numb index finger on my left hand for a long time afterwards. My mitt would crack when the ball hit it; unfortunately, my finger probably cracked also. 🙂 As a college freshman, his pitching arm has only improved since that time. We also were invited by our new friends Nick and Betty to join in on their weekly lunch get-togethers with other folks in the park. From right: Jerry, Linda, Betty, Nick, Ron, Nancy, Diana and me. Here we are at our favorite pizza joint, Oceanside Pizza. Over the course of time, we got to know several people in the park, which has been really fun! During one of the meals, I discovered that Nick used to work for the same company in Louisville as our friend and fellow fulltime RVer Bill Murray Small world. Our ‘to do’ list is whittled down to a few small items, but not before a couple of things were tacked onto it. Edsel 2, our new Escape, had an issue to where the clutches in the rear wheels weren’t releasing when we cornered, so our local dealer (Kelly Ford) took care of that. They found that there was a technical service bulletin issued by Ford for the problem. We can’t say enough about how great our experience was with Derek, our service adviser. We also had our RV air conditioner quit on us the other morning, so we have a mobile tech coming tomorrow to replace that. The general consensus in the park is that we did well by getting 11 years out of our current unit, especially since we exposed it to salt air the past three winters. We also were able to attend this years St. Patrick’s Day potluck in our park. You may recall that we skipped it last year, as I had found out our good friend and my long time colleague Richie had passed the night before. I wrote a post about it called Reflections in the Rear View Mirror. Although we miss Richie, we were able to enjoy this year’s party. After everyone ate, someone broke out their karaoke machine and we all ended up making a day of it! Our time this year in Melbourne Beach is quickly coming to a close. It will be just a few more sunrises and sunsets before we head out on our next adventure. Where will that take us? Our plans are to head up the East Coast to arrive in Maine by the beginning of June, and then back over to Michigan for a bit. The trip from here to Michigan is spread over a four month period, so we have a lot planned along the way. Be sure to stay tuned for that, as well as our new work camping position in Michigan for the months of August and September. Our plans are to come back to Florida next winter. As always, we would love to meet up with you, should our paths converge. Feel free to contact us privately at explorvistas@gmail.com, if you would like to try for a get together. Until next time, safe travels! Every three years, from 1986 through 2010, we would make our pilgrimage from Michigan to Maine. (We missed 2013, as we needed to stay closer to Diana’s mom.). Just driving across the border into Maine from either New Hampshire or Quebec, we felt as if we were ‘home’. Our ultimate destination was Acadia National Park. From the first time we set foot in Acadia, there was something about the place that spoke to us. It is at this geographical point that the Appalachian Mountains meet the sea. Acadia is located mostly on Mount Desert Island (pronounced ‘dessert’, as the French explorers noted that the tops of the mountains were deserted…or devoid of trees). In national park terms, Acadia is rather small. It is also known to be one of the most heavily used parks in the system. With that being said, we have never failed to find solitude here when we have sought it. Acadia is also unique in that they allow dogs on the hiking trails. Our favorite hike has always been the summit of South Bubble Mountain, which overlooks Jordan Pond and the Atlantic Ocean beyond. 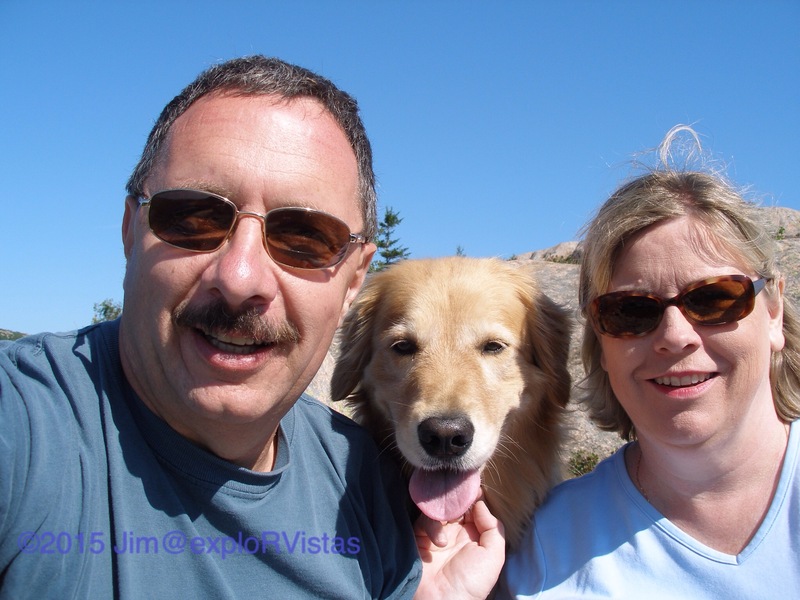 Here we are with Jenny in 2010 at the summit. This is a hike that can be done with all ages and a good set of athletic shoes. Our friend’s four year old, Billy, did it with no trouble at all. Jenny absolutely loved it up there, as did our two previous Golden Retrievers, Katie and Dakota. (Katie’s full AKC name was Belisle’s Acadian Sunset, a testament to the love we have for this place). Maine is chock full of wild blueberries in early August, and Katie was an expert at picking them off the bushes on South Bubble. Dakota, on the other hand, would try to devour the entire bush and would end up spitting the whole thing out. :). Our advice for this hike: get there early, and you won’t see another soul for hours. Another story I am compelled to share occurred in July, 2004. We had just lost both Katie and Dakota to cancer in May and June. Before we got Jenny, we made the trip to Acadia dogless. As we were coming out of Trenton on Route 3, there above the island was a beautiful double rainbow. Yes, indeed…this place speaks to us. 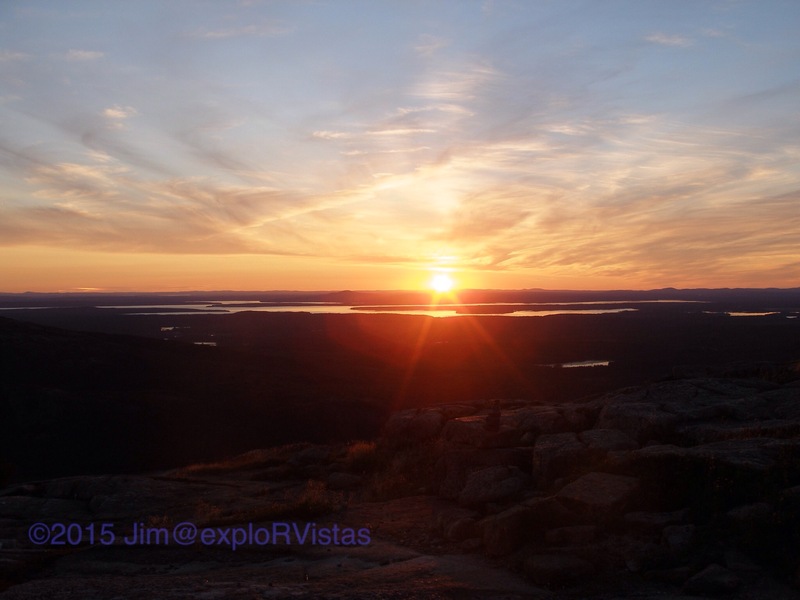 Acadia boasts of having the highest point on the eastern seaboard; Cadillac Mountain. While it is only 1530 feet high, that is from sea level…and the sea is within view. The summit of Cadillac is the first place in the continental US that sees the sunrise each day. Every morning, weather permitting, people make the trek to the top for the spectacle. With Acadia being on the extreme eastern edge of the Eastern time zone, it requires getting up really early! We did it one time with Kate and Dakota. Our preference has always been the sunsets from up there. A great spot to watch the sunset is the Blue Hill Overlook. It is there that we learned (from a Kodak representative who was set up there) the trick to stick around for a half hour after the sun actually sets, as the clouds erupt with color and provide a spectacular show. It only works if there are some high clouds. Next time you watch a sunset with a crowd, watch everyone leave when Old Sol disappears. Stay put with the few who know this secret. You won’t be disappointed. MDI is dotted with several lakes and ponds. This photo is of Bubble Pond. While it looks small, it is deceptively long, and it is crystal clear. While there are usually quite a few people present on the northern shore of this pond, it is rare to find anyone with their kayaks on it. We took the time to get our boats off the truck and paddle it one time, and we were not disappointed. Our favorite paddle is Jordan Pond. Even though this body of water is surrounded by a well used trail, there is a certain sense of solitude once you pull away from the shore. It is on Jordan Pond that our kayaks got their names, Ketchup and Mustard. (Ask us around a campfire about that). Just a note to anyone wanting to paddle the ponds on MDI: these waters are public water supplies, and body contact is against the law. There are local water officers that are authorized to write tickets. We wear wetsuit boots to get in and out of our boats, and we have been personally thanked by the officers for doing so. 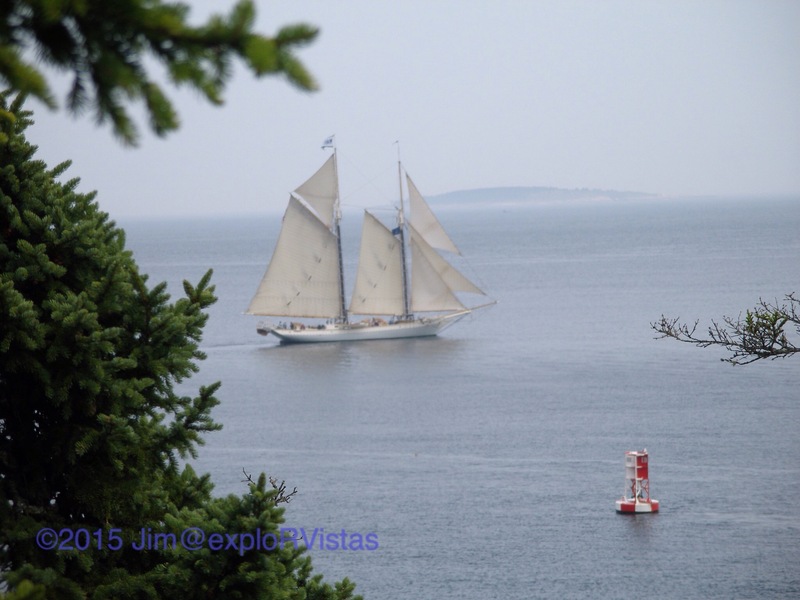 In the previous photo of the top of Cadillac Mountain, you can see a four-masted schooner with red sails. That is the Margaret Todd. 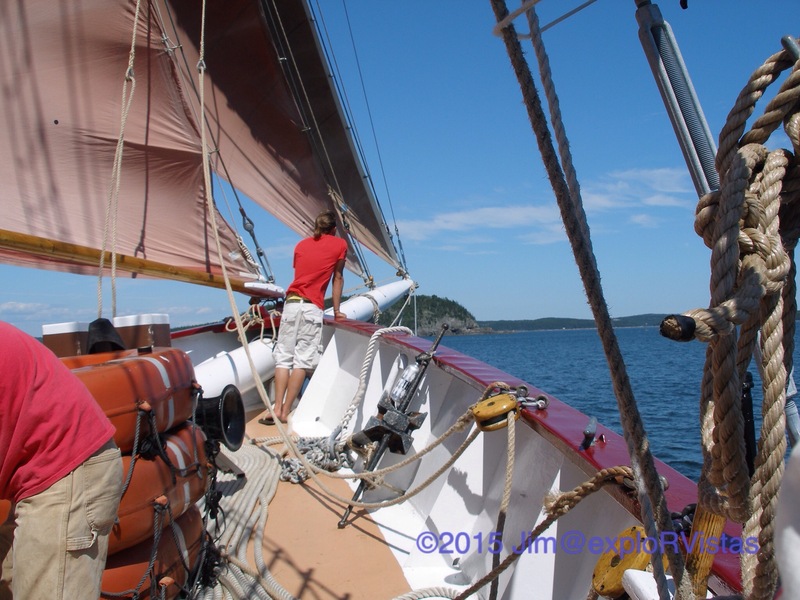 The first trip we took to Maine, we took an evening sail with Captain Steve Pagels on his two-masted schooner Janet May. Each trip back, we made this a tradition. After a few trips, Captain Pagels had sold Janet May and renovated a fishing schooner to become the three-masted schooner, Natalie Todd. 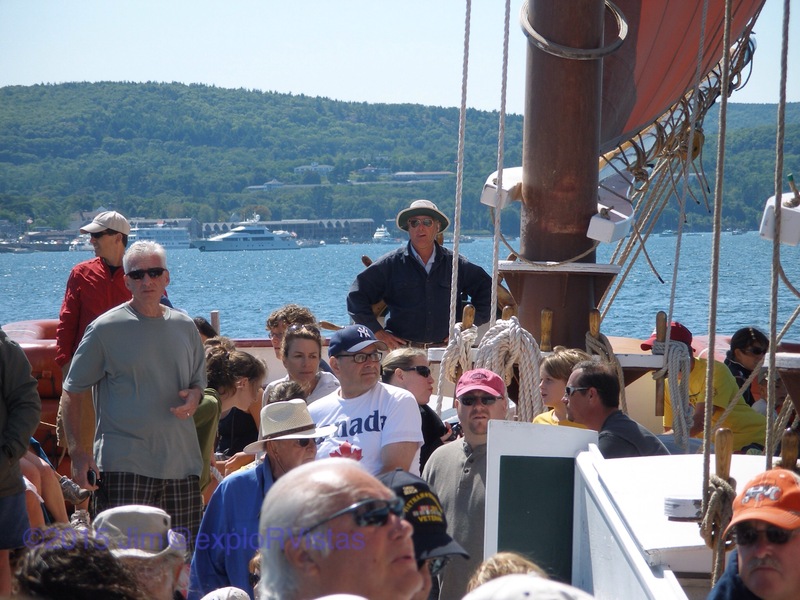 A few more trips down the road, and he stepped it up to build a four-masted schooner, Margaret Todd. As you can see, his cruises have become quite popular. He employs a young crew who spend their summers in the area, and he enlists the help of passengers to help raise the sails. These trips are always a great way to spend an afternoon or evening. 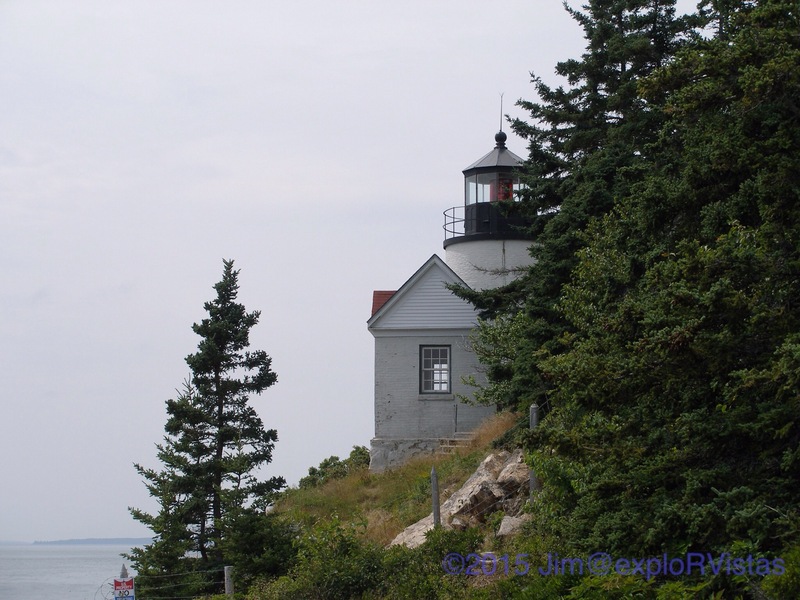 A favorite destination is Bass Harbor Head Lighthouse. While it is not open for visitors, it is a great spot for photographs. 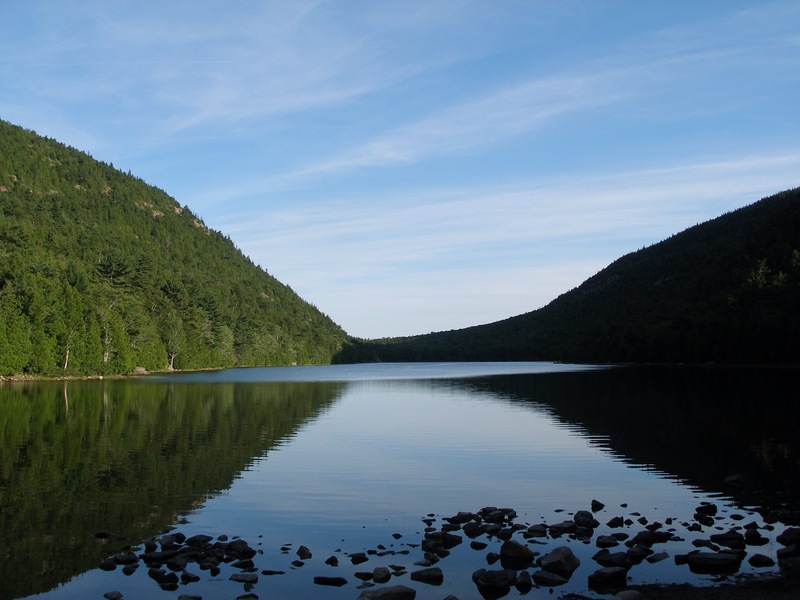 Most of the visitors to Acadia limit themselves to the Park Loop Road….but Acadia is so much more than that. The park has hundreds of nooks and crannies to be explored, some of which you will find complete solitude. Most of the trails are easy hikes, even up the mountains. Some are strenuous, and some are even technical. 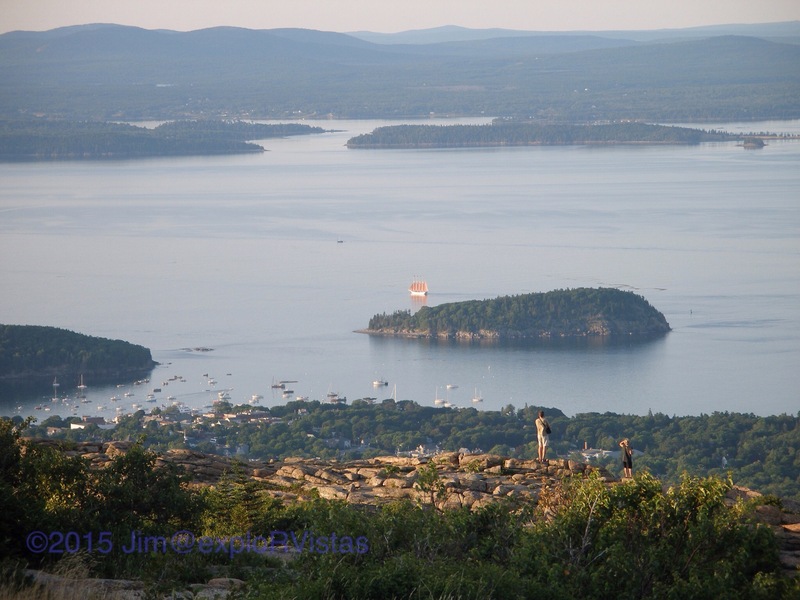 A visitor can go from complete serenity to the nightlife of Bar Harbor within minutes. It is possible to go from seeing a lobster boat in a fishing harbor to seeing the Queen Mary II in Frenchman Bay. A cyclist can navigate their mountain bike on the fifty miles of carriage paths left by John D. Rockefeller (no cars), and sunbathers can spend the day at Sand Beach. A visitor can climb on the rocks with the crowds at Thunder Hole, or explore the quiet side of the island with no one else around. 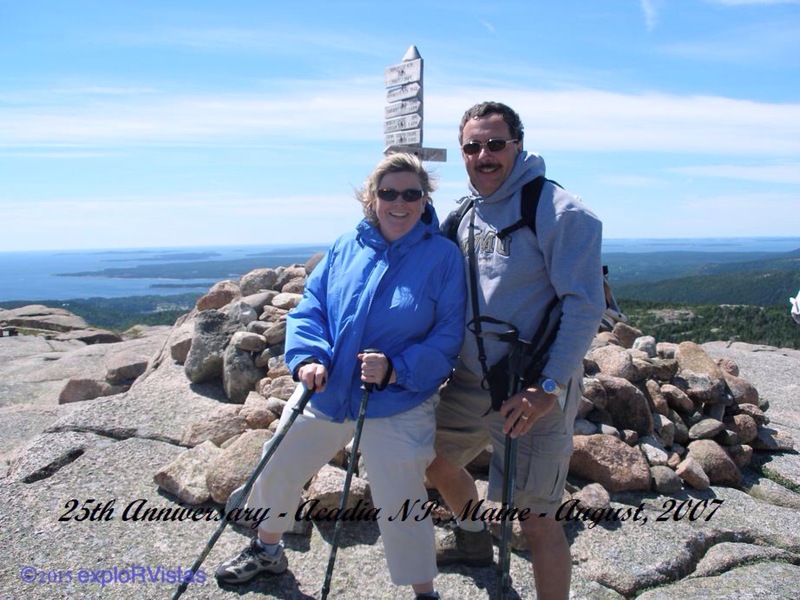 For our 25th wedding anniversary, we chose to celebrate by hiking to the top of Penobscot Mountain. As you can see, Maine and Acadia have become second homes to us. We could write volumes about our experiences there. Even with our numerous two week trips to that slice of heaven, we have only scratched the surface of the many things to do there. We have caravanned with our friends Karen and Bill and their children Nina, Christine and Billy twice, and with Mike and Cindy and their boys Brian and Eric once. They loved every minute of it. Diana and I chuckle when we meet people who tell us that they spent the day there and ‘saw everything there was to see’. We have yet to become bored with Acadia, and we discover another layer each time we go. We have to agree with Will Rogers, as Maine has been, and will continue to be, pure enjoyment for us.